When it comes to gifts, it’s the thought that counts. That’s why this Christmas and holiday season, SK-II has created a gift that is as meaningful as it is beautiful. Continuing in the yearly tradition of giving the Facial Treatment Essence a stunning new look for the festive season, SK-II has adorned the bottles of the iconic miracle water in beautiful new designs that celebrate the power of personal transformation. Themed ‘Wings of Change’, this artistic series of limited edition bottles of SK-II’s award-winning essence is inspired by two of nature’s most beloved winged creatures – the butterfly and the hummingbird – to symbolize the beauty in transformation, and the possibilities of soaring beyond your potential. Depicted in invigorating red and stunning blue, the butterfly and hummingbird motifs embody the uplifting spirit of transformational beauty, making these designs symbolic and meaningful gifts of affirmation and encouragement for every woman on a journey to change her destiny. 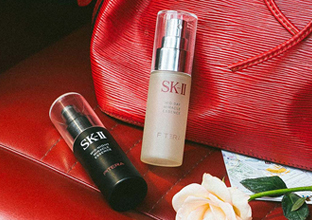 Containing the SK-II essentials, including the best-selling Facial Treatment Essence, this gift set is perfect for encouraging a loved one to change their skin's destiny. Featuring the limited edition Facial Treatment Essence adorned in red butterflies, this coffret set symbolizes the passion and boldness of a woman on a journey to change her destiny. 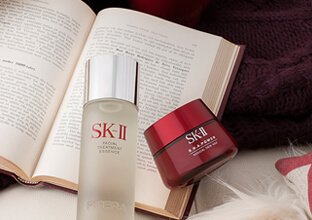 Give the gift of youthful beauty for years to come with this coffret set, featuring the best-selling Facial Treatment Essence and SK-II's revolutionary new anti-aging R.N.A. Power cream. Radiant, glowing skin is within reach with this coffret set featuring SK-II's best-selling whitening produtcs as well as the Facial Treatment Essence decorated in blue hummingbirds, symbolic of perseverance. Featuring SK-II's Luxury Pitera™ series, this extravagant coffret set is the ultimate gift of indulgence to pamper the one you love.